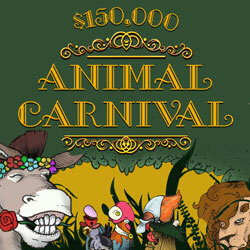 Join in on the competition at Intertops Casino by competing with other players for $30,000 in weekly prizes during the $150,000 Animal Carnival bonus contest. You can earn points when playing any of the hundreds of real-money online casino games available at the casino. The competition begins today and is sure to be a good one! Every week until March 4th, be one of the 300 players that have earned the most points that week and you will each win up to $500. The top 20 weekly winners are also entered in a final draw for a $1000 cash prize (with no wagering requirements). Points are earned automatically by playing any of the casino’s games. One of the most popular games right now is the new Pig Winner, a Chinese-themed slot game introduced just in time for Chinese New Year. It has grouped Wilds that expand to cover the entire reel and double payouts for all the winning combinations they’re part of. The game’s Scatter is a Yin Yang symbol; three trigger 8 free games. If additional free spins are triggered, all subsequent wins are multiplied 3X.